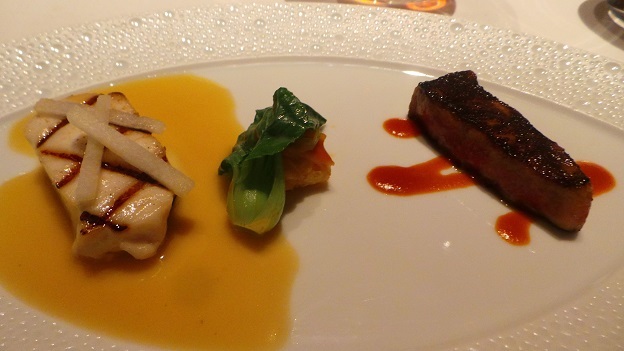 Over the years I have had many fabulous meals at Le Bernardin, but this was the first time I had the good fortune to settle in and enjoy one of the tasting menus at a more leisurely pace than I am used to. When lunch was done, I wondered if we couldn’t just roll straight into dinner, as I truly did not want to leave. The Nantucket Bay scallops are stellar, with a gorgeous interplay of briny flavors from the sea and the bright citrus notes of the vinaigrette. 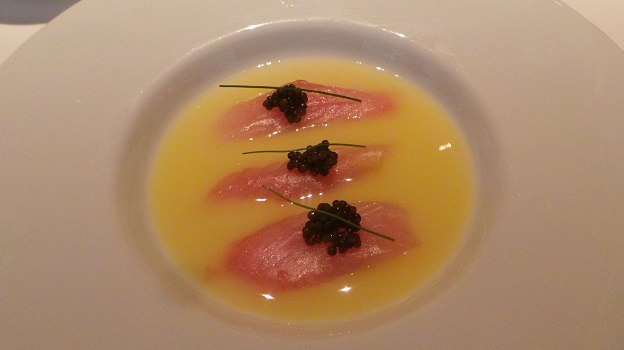 Three strips of King Fish sashimi topped with Osetra caviar are lightly warmed by the Marinière broth in another dish that deftly melds flavors, textures and temperatures. The sautéed langoustine with truffle and Chanterelle is dazzling. What a dish. A lobster lasagna with truffle follows. 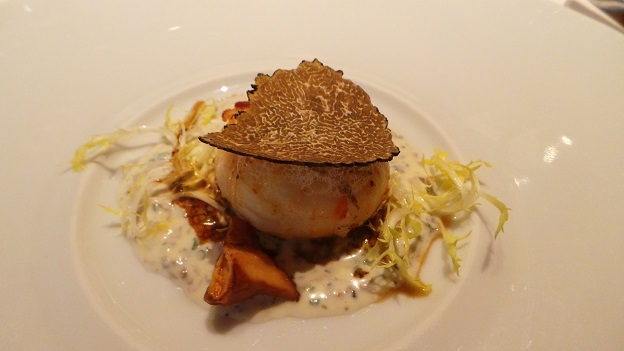 While delicious, the lasagna plays on two of the same themes as the previous dish; name shellfish and truffles. Don’t get me wrong, both courses are fabulous, but they are also pretty similar. Coche-Dury’s 1997 Meursault is gorgeous with the early courses. Now wonderfully mellowed by time, the 1997 is peaking. Although not profound, it is such a joy to drink a mature Burgundy that has aged as it should have, something that is such a challenge for so many wines made during this era. Our pan-roasted monkfish with Armagnac-black pepper sauce is stellar. We have entered the realm of red wine, and what could be better than Burgundy with this food? Philippe Engel’s 1985 Clos Vougeot is a real treat. Exotic spices, crushed flowers, tangerine peel and sweet red cherries lift from the glass in an exquisite, translucent Burgundy that impresses for its finesse and nuance. Time has been very kind to the 1985, but at our table the feeling is that time has stopped as we appreciate the magnificent beauty of a Grand Cru Burgundy that is at a glorious peak of expression. The grilled escobar and seared Wagyu beef, a sort of high-end surf and turf, is fabulous. In all of the years I have been dining at Le Bernardin, this is the first time I have had beef, and it is stellar. What a great combination. A pre-dessert and two desserts follow. 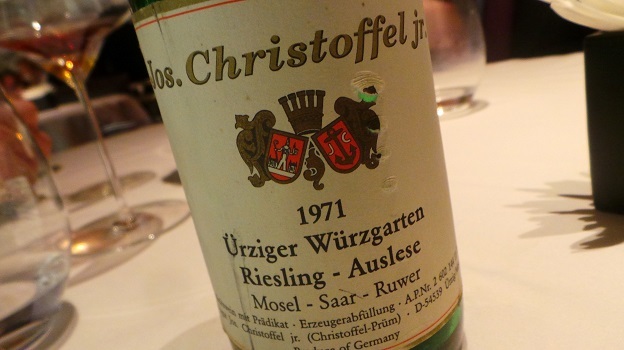 They are both terrific, but I am transfixed by the 1971 Christoffel Ürziger Würzgarten Riesling Auslese, a wine that appears to be at a glorious plateau of maturity. Age has mellowed the flavors nicely, but the 1971 shows no signs at all of fading. Today, it is simply glorious. A second glass follow the first, but then the reality of having to get back to work sets in. A quick double espresso follows, but the memories of this fabulous lunch will remain for a long time.